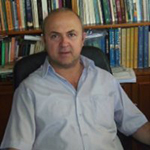 Dr. Athanasios Velentzas holds a PhD in Science Education (National and Kapodestrian University of Athens). He graduated from the Physics Department of the University of Athens and holds a MSc in Science Education (University of Athens). He teaches Physics in public upper secondary schools, while he was associate researcher for 3 years in the Educational Research Centre of Greece (KEE). He worked at the Pedagogical Institution, Greece and he is currently Head of the Educational Science Laboratory Center (ΕΚΦΕ) of Ampelokipi, Athens.